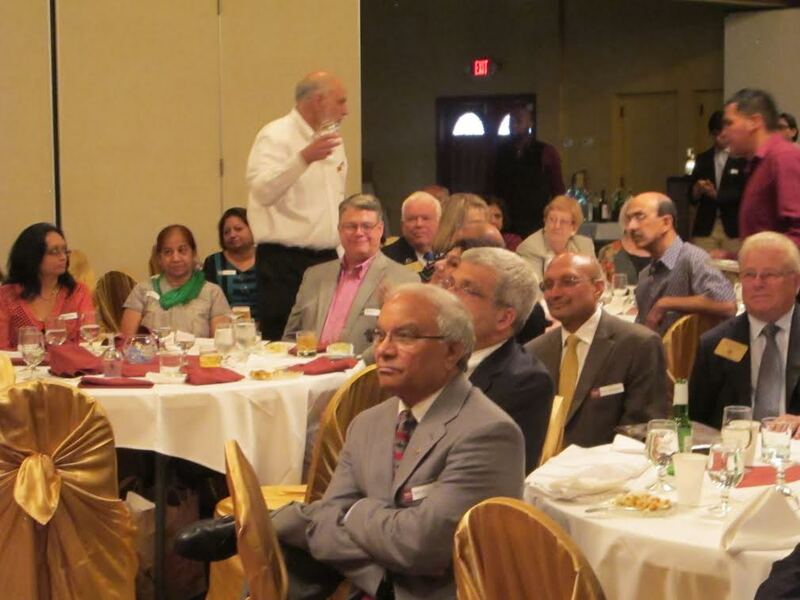 Atlanta, GA: The first Indian-American Rotary Club of Emory Druid Hills inducted the 2015-2016 office bearers and recognized Rotary members for their services at its annual induction dinner held on Wednesday, June 17 at Palace restaurant, Norcross. Several Rotarians and community leaders gathered at Palace restaurant to welcome and usher out the present and past Rotary officers. Norcross city Mayor, Bucky Johnson was in attendance and inducted Shiv Aggarwal, a well known community leader as new Rotary president for 2015 -2016, starting from July1. Other office bearers of president Rotarian Shiv Aggarwal are Rotarians Chandler Sharma – Immediate past president; Manohar Singh – President elect (2016-17); Dr. Nazeera Dawood – Vice president; Ravi Devulapalli – Secretary; Bhairavi Nadgonde – Treasurer; Ravi R. Ponangi – Administrator; Naveen Shroff – Sergeant At Arms; Mustafa Ajmeri – Director at Large; Ravi Chander – Chairman, Foundation Committee; Kishan Goyal – Chairman, Membership Committee; Chittaranjan Jyotishi – Chairman, Club Service Projects; Farzana Kalvert – Co-chair for Awards Committee; Ravi Devulapalli – Co-chair for International Projects. Rotary district 6900 governor elect Bob Hagan delivered keynote address. Assistant district governor Christine Barrett, Past District Governor Barry Smith and Councilwoman Lorri Christopher of Peachtree Corners were also in attendance. Chandler Sharma who is a Rotarian since 1984 and outgoing president of the club presented a review of the performance of the club for the last one-year. He said every week he looks forward to Wednesday meetings. He informed the gathering that Rotary club of Emory Druid Hills (RCEDH) has great talent and skills and has done great things in building peace and humanitarian projects. RCEDH is a small club, but has taken up many humanitarian projects. Later on Rotarians Ravi Devulapalli and Ravi Chander presented a glimpses of projects which RCEDH has undertaken not only here in USA but also in India. Chandler Sharma appealed to the incoming team to increase and sustain membership. “Make the club more active and more successful,” he said. He said that the club has become a 100% Paul Harris Fellow club. Finally he appealed Rotary members to make the club activities and achievements known to the community and encourage them to join the club to help strengthen the club activities. 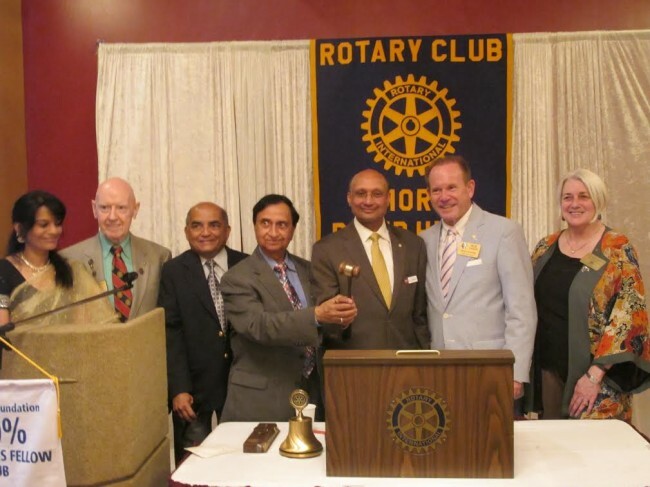 After installing Shiv Aggarwal as the president of RCEDH, Norcross city Mayor, Bucky Johnson said Rotary is a great organization doing a fantastic job at the international level. Shiv Aggarwal, in his acceptance speech said he was excited about the great honor of being the president of the club. He assured fellow Rotarians that he would do his best as president. In his remarks, Rotary District Governor elect Bob Hagan commended and appreciated the club’s achievements and in particular, the clean water projects taken up inIndia. Each year, the club elects a new board of officers to lead the club from July 1 through June 30 of the following year. Rtn. Dr. Nazeera was lively and engaged audience through out the proceedings as emcee for the event. The first Indian American Rotary Club of Emory Druid Hills (RCEDH) meets every Wednesday at Ashiana Restaurant in Global Mall at 12:15 PM.